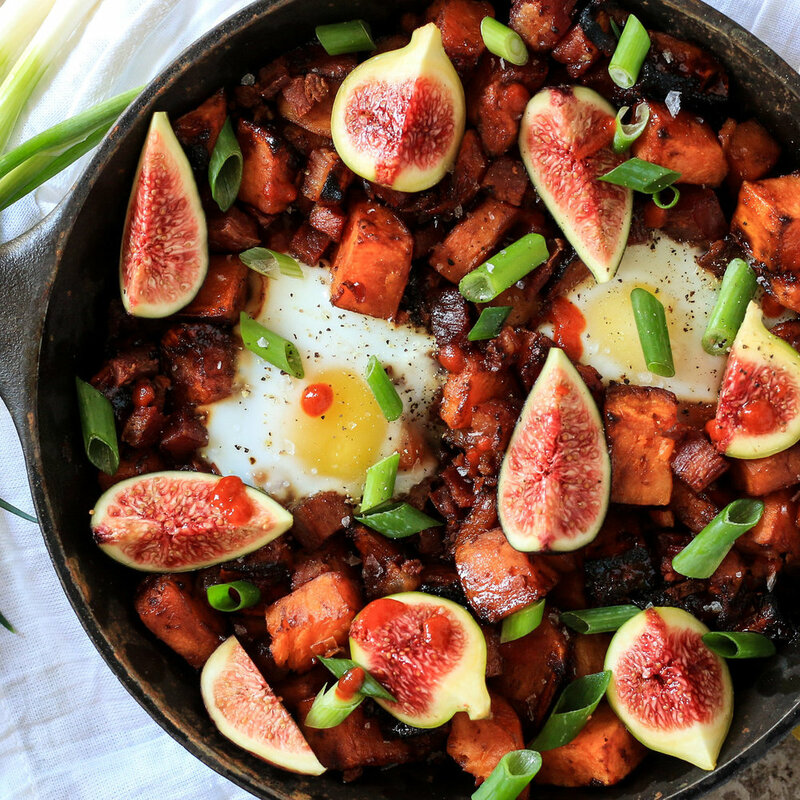 This skillet is the perfect combination of both sweet and savoury. Heat oil over medium-low heat in a large skillet. Fry pancetta until most of the fat is rendered and the pancetta is golden brown. Remove the pancetta from the skillet with a slotted spoon and set aside. 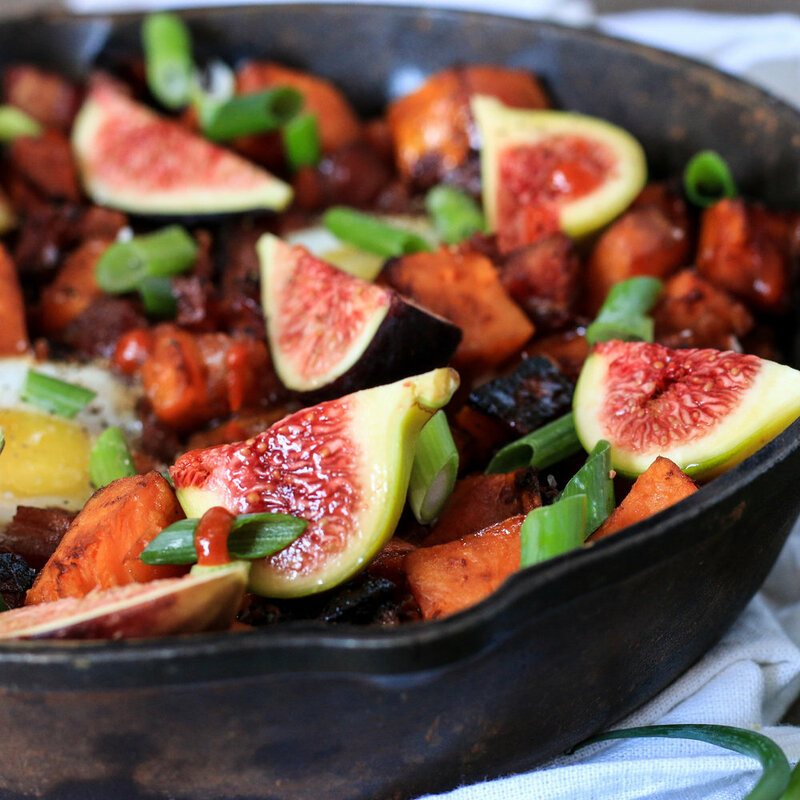 Place cubed yams in the skillet with the pancetta fat and increase the heat to medium. While the yams are browning, whisk together the maple syrup and Sriracha sauce in a small bowl. Pour 3 tbsp. of the water over the yams, cover with a lid and cook for 10 minutes or until yams are fork tender. Remove the lid and continue to cook until they are nice and crispy. Return the pancetta to the skillet and stir to combine. Create two wells in the yam/pancetta mixture to crack your eggs into. For soft eggs, place the skillet under the broiler for 3 minutes, or until the whites are set. For a hard yolk place the skillet in a preheated oven at 400F for approximately 12 minutes. Remove from the oven and scatter fresh figs and green onions on top, and drizzle with the maple chilli glaze. Season with salt and pepper. Serve with additional hot sauce if you like the heat!